The substantial press coverage for pub group JD Wetherspoons' recent anti-EU PR activities suggest firms can benefit from being open about their pro-Brexit opinions, the company's PR chief has told PRWeek. Three releases issued by JDW in the past two weeks have generated more than 220 articles online, according to Eddie Gershon, head of Gershon Media Relations, the company’s retained PR agency. Most quote Wetherspoons chairman Tim Martin, who has become among the most prominent UK company bosses campaigning for Brexit. 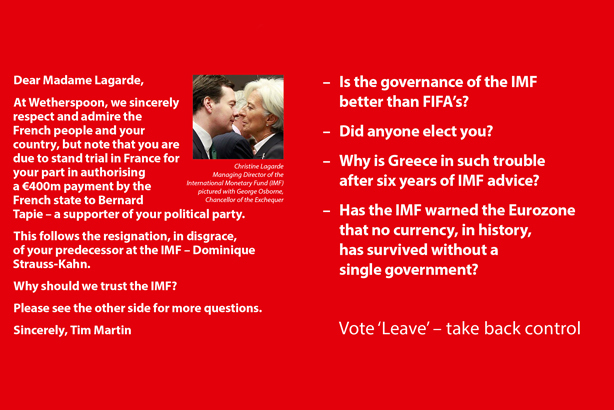 The releases were: an article by Martin on the EU referendum; a press release highlighting Martin’s tour of 100 Wetherspoons pubs before the vote; and news that Wetherspoons is introducing beer mats featuring anti-EU messages – and comparing the IMF to FIFA – in all its pubs. Martin has been interviewed on a number of national TV and radio shows in recent days, including Sky News, BBC Radio Four’s Today programme and Talksport. He also spoke to overseas media, including Swiss, Dutch and Japanese newspapers and German, Dutch and Japanese TV. Meanwhile, regional daily and weekly media have been taking up invitations to interview Martin at the pubs during Martin’s tour. The activity comes as the PR industry debates the merits or otherwise of companies taking a public stance on whether the UK should leave the EU. Gershon told PRWeek: "It is a well know fact that Wetherspoon founder and chairman Tim Martin is a Brexit supporter, so putting out a ‘leave’ message to its customers was never an issue for Tim or the company. Wetherspoon has always been a company that enjoys engaging with the press to get its message over. "Putting beer mats in the company’s pubs is good in itself, but the bigger message was to tell as many people as possible, not just Wetherspoon pub-goers, that the company had something to say about the IMF and the EU. "We always felt that a hard-hitting message on a beer mat would gain the attention of the press, although we were surprised and pleased at the amount of coverage in print, online, Twitter and on radio and TV too. "It is understandable why some businesses might wish to keep quiet on their views, but in our opinion, the general public and journalists prefer to engage with company bosses who say it as it is and get people talking." Click here to read PRWeek’s interview with Martin from earlier this year, in which the Wetherspoon chairman discusses his views of PR and journalists.